My lips are numb, and there’s a good chance I’m drooling. I’ve just gotten home from the dentist, you see. After 27 years as a blissfully cavity-free person, my teeth have violently betrayed me and my tendency to “forget” to floss. Big time betrayal. I mean, I thought we were in this together, teeth! …Traitors. Upon arrival at my twice-yearly checkup on Friday, I was informed that I had not one, but two cavities getting cozy in my chompers. Two. Cavities. Naturally, I was horrified. I gasped and I grumbled, my world of clean, sturdy enamel shattered before me. Not that I was dramatic about it. I mean, psh, whatever. Just a few cavities. Just a few needles and drills and fake things in my mouth. No big deal, whatevs. I totally didn’t tell everyone I came in contact with about my two cavities, and I definitely didn’t whine about my terror at having them filled. Nope. 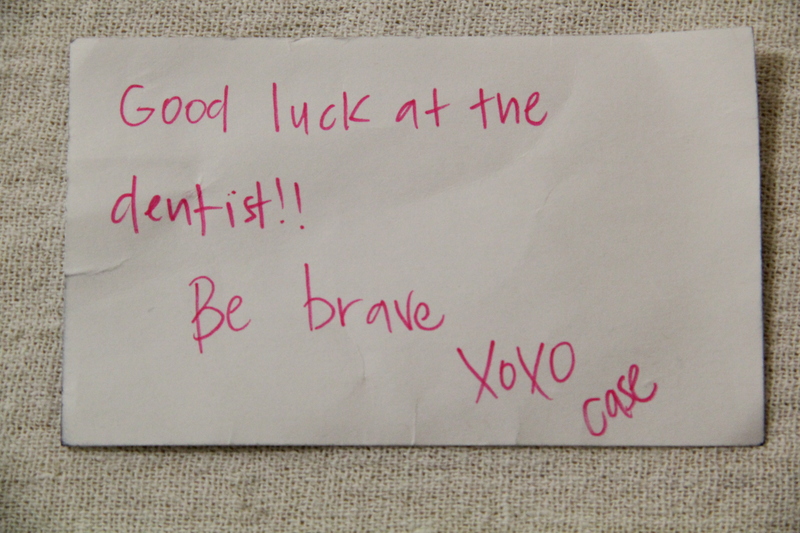 I mean, there’s no way I worked myself up about it so badly that my sister had to leave me a good luck note this morning, before she left for work. Nope, I was totally brave. 100% cool, collected and nonchalant about the whole deal. I smiled at the needle full of novacaine, at the tiny toothy drill. No wide eyes or whimpers here, that’s for sure. All smiles. At least, I would be all smiles, if I could, you know, smile. The most I can manage is a creepy, close-lipped half smirk; seems my lips won’t do what I ask them to just yet. I recently tried to put on chapstick — glad no one was here to see that. Dinner is my next challenge — though chances are I’ll just be having some yogurt. Or a milkshake. 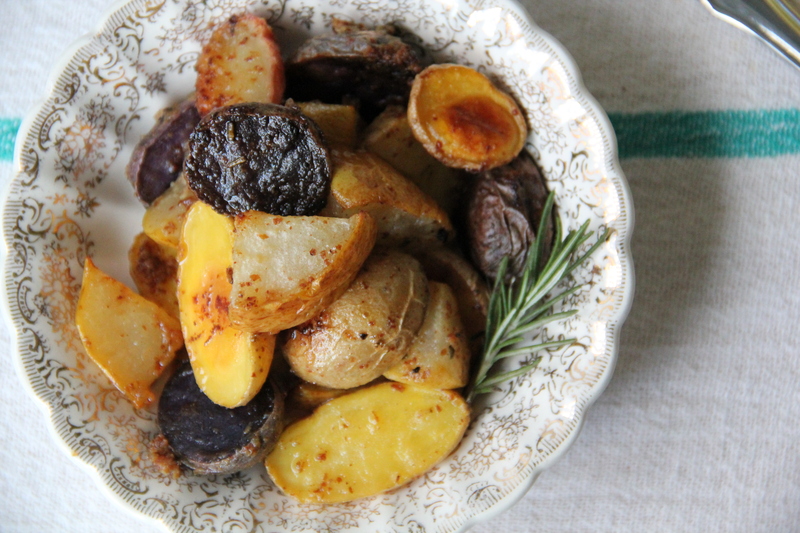 You should eat these potatoes, and these pears. They get all mixed together with some mustard, lemon, olive oil and herbs, and then roasted to sweet and salty perfection. 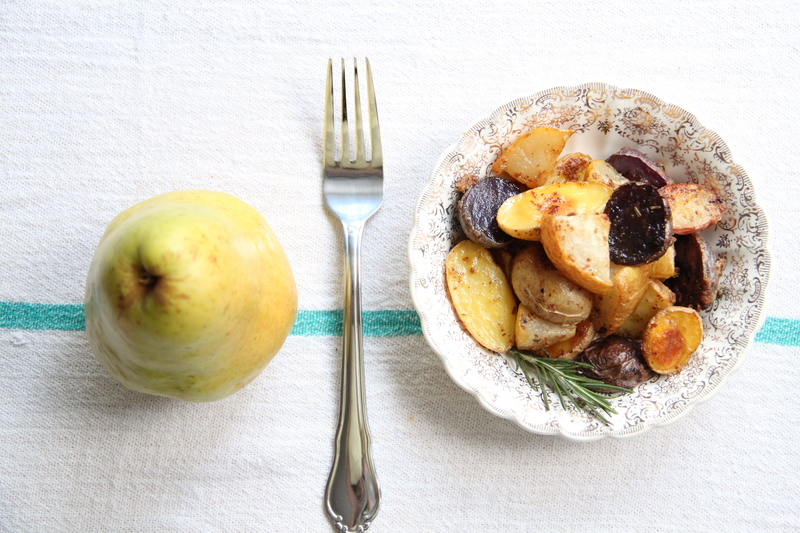 The earthy potatoes and the sweet pears make one badass team — and would be quite welcome as a tasty new side dish at this year’s Thanksgiving table. Just throwing it out there — it’ll be here before you know it. For now, though, serve these with a piece of roast chicken or pork, or throw them on some arugula for a hearty fall salad. It’ll be a meal you can really sink your teeth into. Probably. 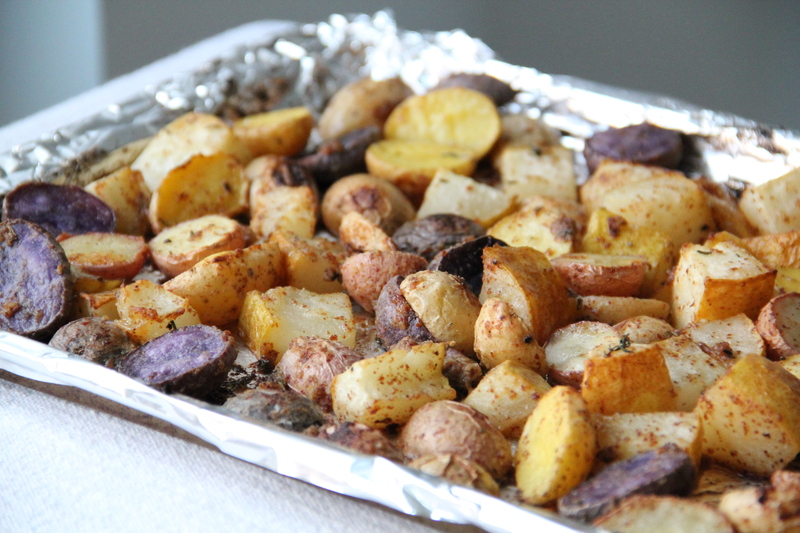 Preheat the oven to 400 degrees F. Line a large baking sheet with tin foil. In a large bowl, whisk together the mustard, lemon juice, salt, pepper, olive oil, thyme and rosemary. Add the pears and potatoes to the bowl and toss gently until evenly coated with dressing. Arrange the pears and potatoes in a single layer on the prepared baking sheet, and bake in the hot oven until browned and beginning to crisp, about 45 minutes. Serve warm or at room temperature, garnished with extra thyme or rosemary.